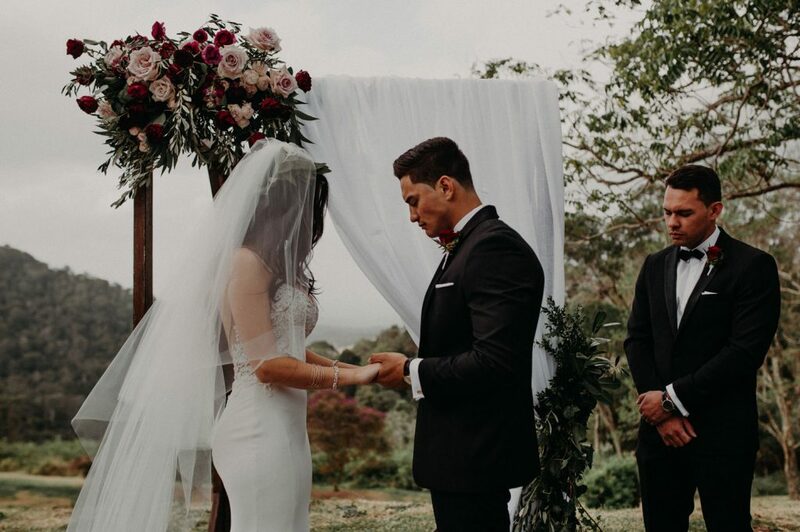 We had our wedding at the Maleny Manor and it was honestly perfect. The Maleny Manor Team were wonderful to work with and so very accommodating. Their expertise ensured the day ran very smoothly – we really didn’t have to worry about anything as they were always on top of everything and offered great advice! The Maleny Manor Team really go over and beyond to ensure your day is all you’ve dreamt it to be. The staff are extremely professional and we continue to receive comments from guests about just how wonderful the day was and how beautiful the venue is. It’s not hard to see why the Maleny Manor is voted #1 in Australia!! The food was also AMAZING! I think the potato gnocchi was the biggest hit for our guests – so yummy!! We can’t thank them enough for how perfect everything was – the day was flawless! This colour pallet features a base of Ivory, Bright Whites and Beige Linen. Teamed with Blush, Dusty Purples, Wild Berry & Marsala. These gorgeous tones are complimented with Rustic Timber elements and lots of lush Forest Greenery.